Sometimes, it's even worse, with even less elbow room, especially when a coupon dozen cartons of helmets arrive. 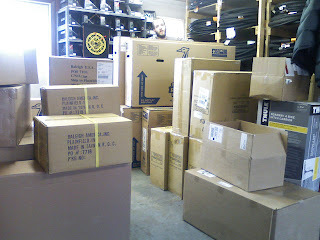 This week, among other things, we got a stock of accessories from Raleigh, a supply of trainers from Blackburn, the first of the new shoe models from Pearl Izumi, and the first 16 of the new rental bikes for the coming season (10 Raleighs and 6 Electra Townies). What comes next is verifying each shipment for accuracy, receiving them into our inventory system, applying price tags, and splitting them up for shipment to our other two stores. More of the new '08 bike models from Raleigh have also arrived recently, including the highly-anticipated touring/commuting bike, the Raleigh Sojourn. In stock and ready for test riding now!